Home / Uncategories / Lekki British School Announced Entrance Examination Date. 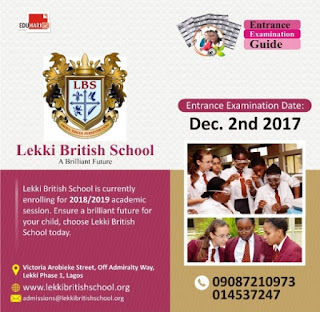 Lekki British School Announced Entrance Examination Date. Lekki British School, an International school that provides the highest possible standard of education to its students, enabling them to compete in an increasingly competitive global environment. The school is located on Victoria Arobieke, Off Admiralty Way, Lekki Phase 1, Lagos. LBS aims to allow every child discover and develop their unique talents within a disciplined and caring traditional British environment. Their mission statement is "To provide an environment in which each individual is assisted to discover his or her academic potential in study, sports and personal development". Lekki British High School has a unique ethos of excellence that permeates all aspects of school life, making the experience of learning holistic as students have access to support, advice and guidance. LBS is currently enrolling for the 2018/2019 academic session. Interested applicants can pick up the form at the school premises before the entrance exam date. The Entrance Examination is slated to hold on the 2nd of December, 2017 at the school's hall. According to the Spokesperson of the school, as many students transfer from various curricula, prospective students are required to take an entrance examination and also go through an informal interview which would form part of the overall assessment. Admission into the school will not be based on ethnic, religious or social grounds.